QUEENSLANDERS want a state where all children have basic literacy and numeracy in primary school. They want everyone to enter adulthood with life skills and broad knowledge. Queenslanders want to achieve the narrowest gap between the healthy and the poor through meaningful employment opportunities. They want more people volunteering and showing their community spirit through the mud army, fire fighting, sporting clubs or lending a helping hand to a neighbour. 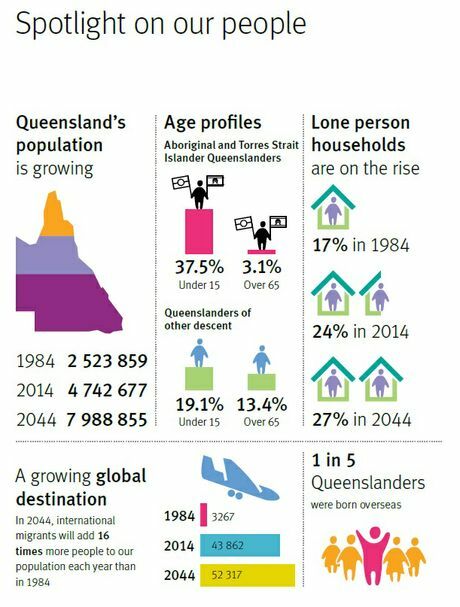 They believe the regions are the engine rooms of the state - hoping to double the regional population outside south-east Queensland by 2044. The 80,000-odd people who had input into the Queensland Plan also believe the state needs to diversify its industries - and take advantage of the people and natural assets - to remain globally competitive. These are the grand ideals which the Queensland Plan seeks to reduce into achievable goals and targets for the next 30 years. The plan delves into what success will look like when a goal is achieved and how it will be measured - mostly through surveys and other statistical analysis. The 104-page document, though highly technical at times, speaks of being bold and striving for lofty goals for the betterment of the state. 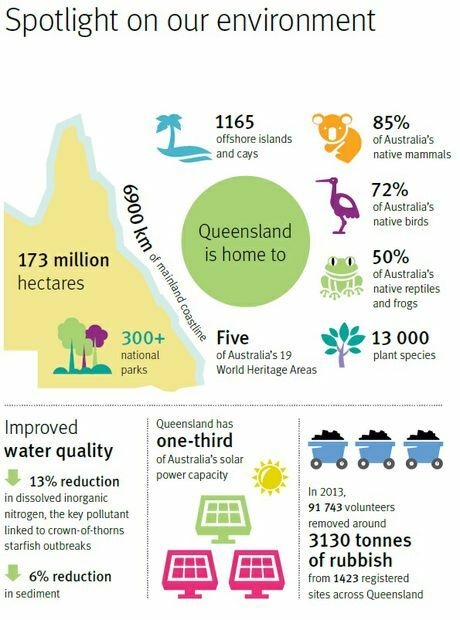 Premier Campbell Newman said Queenslanders' feedback was that they wanted to maximise our natural talents and assets and envisaged a state that was focussed on industry development and diversification and with centres of excellence that drove innovation. Launching the plan at the Local Government Association of Queensland Regional and Economic Conference in Hervey Bay today, he said the Queensland Plan offered many challenges to government with targets such as doubling the population of regions while other goals would require new thinking from all levels of government. Minister responsible for The Queensland Plan, Andrew Powell, said the plan set bold, new targets that would take transformative action and dedicated focus to achieve but he was confident Queenslanders would rise to the challenge. The government will respond to The Queensland Plan later in the year. But the plan tells Queenslanders how they can get involved right now. • Enrol in a course for personal fulfilment. • Volunteer your time to act as a community or professional mentor. • Invest in training for your workforce and encourage life-long learning in and outside the workplace. • Set up a blog to deliver advice online. • Talk to your child's teacher about how you can help your child learn. • Volunteer to help in the classroom at your local school. • Talk to someone new-meet and greet your fellow Queenslanders. • Share your culture and family story with someone and find out about their history. • Get involved in your community-lend a hand to a neighbour or volunteer. • Think about how your club or community organisation can attract more members with diverse backgrounds. • Celebrate diversity-visit an historical museum or Indigenous art gallery or join in a cultural festival. • Consider how your business and your customers can benefit from a more diverse workforce. • Use regular 'town hall' meetings to explore new ideas and solve local problems collaboratively. • Create a local industry think tank to identify, coordinate and capitalise on regional economic strengths and opportunities. • Buy local where you can-support local industry and businesses. • Use local tourism promotions to emphasise regional strengths and attractions to not only attract tourists, but also position regions as great places to live and work. • Join forces with neighbouring communities to explore new ideas and ways of working together. • Think big-build on your strengths and explore ways to compete globally and connect to markets across the state, the nation or the world. • Get active-walk, run or exercise. • Join a sports or social club. • Visit a friend or find time to make new ones. • Learn about ways to make your body and mind healthy, feel better and get more out of life. • Contact your local council to find out about sports and recreation programs in your area. • Quit smoking or support someone else trying to quit. • See your doctor early to help prevent a small health problem becoming a bigger one. • Learn how to cook a new dish. • Check in on your neighbours. • Spend time with people who make you laugh. • Reduce your personal or business consumption of natural resources and consider alternate energy sources. • Volunteer for the Clean Up Australia campaign and help remove rubbish from our parks, streams and beaches. • Plant a tree or green up your garden. • Recycle or reuse materials-try swapping unwanted or unused things with neighbours and friends or find a swap meet. • Buy local produce where you can and reduce the carbon footprint of your food. • Become involved as a conservation volunteer in your local community. • Subscribe to local and international think tanks and keep up to date about alternative energy solutions and environmental issues. • Take the time to visit and enjoy a national park. • Travel on public transport where possible to reduce congestion. • Shop locally to reduce pressures on our transport infrastructure and your costs. • Use logistics and freight efficiently-shipping goods in bulk reduces pressure on the transport network. • Substitute some travel by going online-work from home, use video conferencing or connect via social media. • Use the internet to build networks, make new connections and explore opportunities. • Consider how your business can better connect locally and globally. • Share your love of reading by volunteering at your local school or library. • Be a mentor for someone - share your experiences and life skills. • Nominate a local hero. • Participate in kindergarten and prep-class adopt-a-grandparent programs. • Make your voice heard in the community. • Employ mature age workers for the skills, experience and mentoring they bring to businesses. • Design government and business facilities to make sure they are accessible for older Queenslanders. • Listen to the stories and learn from the wisdom of Aboriginal and Torres Strait Islander elders. together for the benefit of the state." Wide Bay/Burnett: "We are indeed an ageing population. The elderly have much experience and knowledge. We need to harness that experience and wisdom as well as encourage the youth of this stage to flourish." Webjam participant: "The best way for Queensland to move forward is to consider that we have a wonderful clean environment that produces world class food. We have abundant tourism opportunities. We have innovative people in communities. We need to flush out these opportunities, support the entrepreneurs and reward 'home-grown'." Whitsundays: "All delegates felt honoured and grateful to be a part of this outstanding planning initiative." Regional Queensland: "It is relatively easy to make a list of where Queensland should be in 30 years time, it is a lot harder to come up with ways and means to achieve same. Let's not let that opportunity escape us!" South West Queensland: "Prioritise education from pre-school age to post school. For this to occur it will require more than investment, there will need to be a cultural shift to prioritise education within our country." Wide Bay Burnett: "Deliver more practical lessons, get children involved with community projects… not just in the classroom learning theory." Wide Bay/Burnett: "We need to develop communities that are welcoming towards people with disabilities, to enable all people to be able to contribute to our community-in work, recreation, sport, volunteer roles, school and the broader community." 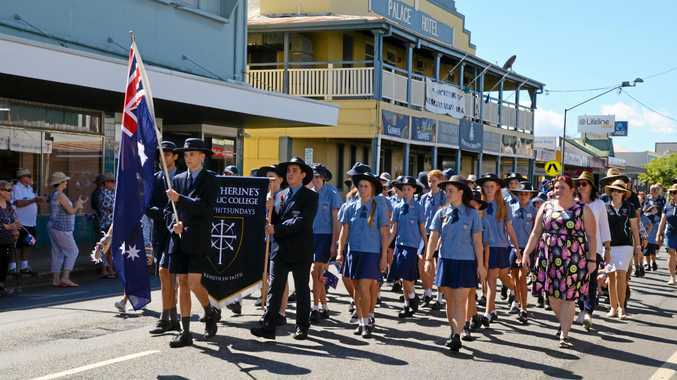 South East Queensland: "Inclusivity is important-people need to realise that being part of a community requires acceptance and celebration of differences rather than homogeneity." Sunshine Coast: "Communities with trees and parks and community vegetable gardens also encourage people to work together." Mackay Isaac Whitsunday: "Build ownership as a state as opposed to the local and regional Queensland mentality of us and them." Darling Downs: "Allow regional and rural facilities to expand and become centres of excellence. Encourage and support fertile minds into these areas, to allow local residents to stay in towns, and encourage others to move there." Wide Bay Burnett: "Empower each region to build its own strengths and resources… Decentralisation is key to making each region responsible and independent." South West Queensland: "Energy and funding should go into each community in such a way that they can continue to grow and prosper. This is particularly relevant in regional Queensland where the population may not be dense, but there are some really innovative and creative ideas that need support from the state to really flourish." Darling Downs: "We need to think big-picture and focus on our strengths such as agriculture, education (as an export industry), and manufacturing. With growing world population, food production will be in higher demand. 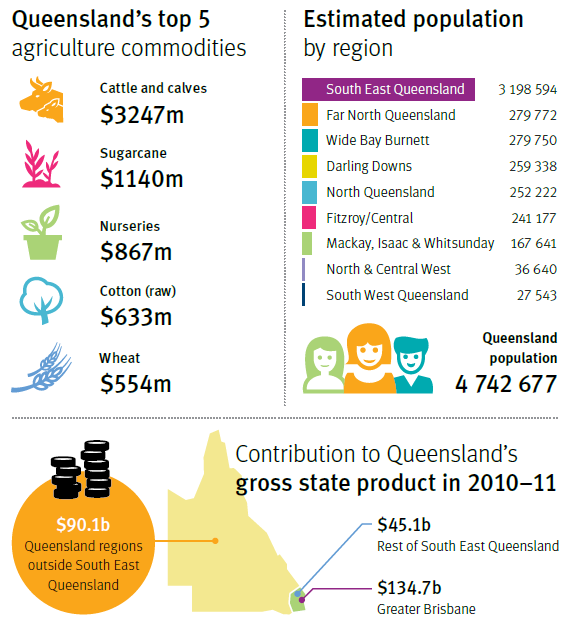 Support development of northern Queensland and a new food-belt." Wide Bay Burnett: "We need to be the pioneers we once were in areas of science, alternate energy and agribusiness." Fitzroy/Central: "By better urban planning we can foster better lifestyles which can help combat obesity, daily exercise to avoid health problems later and relearning everyday social skills as we greet each other daily." South-East Queensland: "Health and healthiness are two different things-and we all need education and health promotion to enable better choices. Everything in moderation is good-the only thing that should never be moderated is laughter." North and Central West Queensland: "People have to want to have a healthy lifestyle and get out in the community. Maybe if [we] encourage them to join community activities it would help make a difference." Brisbane: "It is absolute rubbish to say that healthy food is more expensive. I grew up in the country and it's amazing how many meals you can make with flour, eggs, mince, cheese and a few vegies." Wide Bay Burnett: "Think about living with the environment and not try and make the environment live with us." Brisbane: "The natural landscapes are also intrinsically valuable, and worth protecting in their own right as unique parts of the planet really radically different to anywhere else." Darling Downs: "A balance between mining and agriculture and still having free land for conservation is important." Fitzroy/Central: "We need more courses on environmental engineering, green technologies, and encourage the individual to live a more sustainable life." Wide Bay Burnett: "Plan and build the infrastructure that will accommodate future needs. Proactive rather than reactive so that the future is being built while we are enjoying the benefits now." Webjam participant: "My personal aspiration for my regional area, is a highly connected place, open space, efficient transport networks. I would like a community who is committed to re-use, re-cycle and renewal or multiuse of existing infrastructure." Fitzroy/Central: "Start investing in infrastructure and source technology to ensure we stay at the edge of innovation." South East Queensland: "We will invest in vital infrastructure and use our assets and resources wisely." Private business: "Linkages are critical, road, rail, broadband. Without these, the knowledge base will move to where the linkages are. If we have ubiquitous high speed mobile broadband and high speed rail and roads connecting regions, it decreases the incentives to relocate." North and Central West Queensland: "Local ownership is key, if people do not feel ownership in their communities they have no reason to engage." Private business: "I'd like to see more community involvement in decisions affecting their areas. While time consuming, it's a fair and equitable way for valid opinions and valued skills to be included in local efforts." Greens: Why would we get rid of Renewable Energy Target?